The oldest indication of a castle garden outside the walls of Cadolzburg is to be found in a list of land-owners’ possessions (land register) dating from 1464. The earliest proof of a garden within the castle walls is a drawing by the landgrave Moritz von Hessen dating from 1629. In this sketch, the area between the horse pond and the moat is described as a "pleasure garden". The narrow meadow areas between the two baileys surrounding the main castle were planted in the 18th century with high-stemmed fruit trees. There were also two large meadows outside the castle complex with fruit trees. The walled castle garden is divided into various zones. The higher garden area is structured with a network of paths. All that remains of the garden pavilion that once stood in the south corner is the sandstone base. 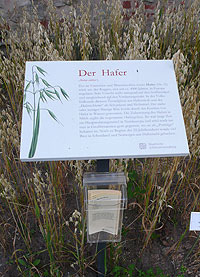 The Bavarian Palace Department has planted this part of the garden with a display of many different historical varieties of grain (apart from rice). 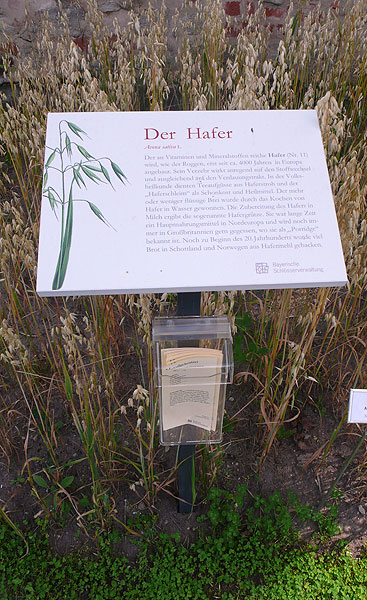 Free recipes are also available for some of the grains. The lower section of the garden, separated by a hedge, is closed off on the east side by a high fortified wall and at the northern tip by a small, fortified belvedere with a tiled tent roof. 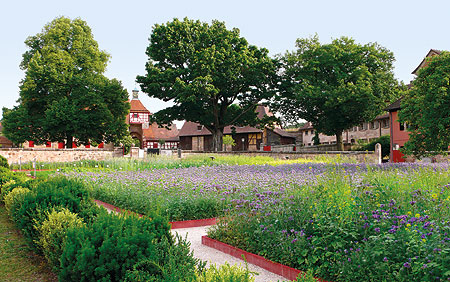 The flower meadow with a path winding through it is planted with high-stemmed fruit trees.